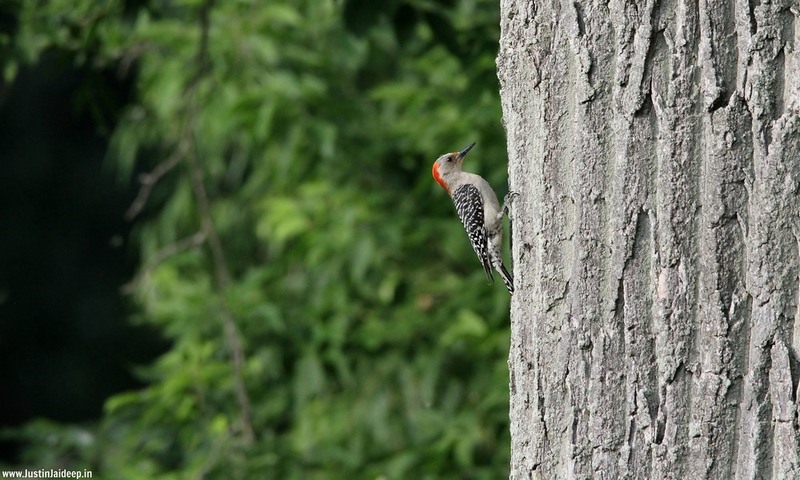 Red-bellied Woodpeckers are pale, medium-sized woodpeckers common in forests of the East. Their strikingly barred backs and gleaming red caps make them an unforgettable sight – just resist the temptation to call them Red-headed Woodpeckers, a rarer species that’s mostly black on the back with big white wing patches. A sleek, round-headed woodpecker, about the same size as a Hairy Woodpecker but without the blocky outlines. Often appears pale overall, even the boldly black-and-white striped back, with flashing red cap and nape. Look for white patches near the wingtips as this bird flies. Look for Red-bellied Woodpeckers hitching along branches and trunks of medium to large trees, picking at the bark surface more often than drilling into it. Like most woodpeckers, these birds have a characteristic undulating flight pattern. Red-bellied Woodpeckers are common in many Eastern woodlands and forests, from old stands of oak and hickory to young hardwoods and pines.